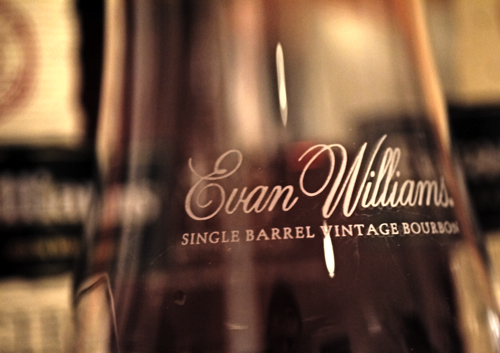 Evan Williams Single Barrel Vintage is one of the annual whiskey releases I look forward to every year. It’s consistently one of the best bourbon’s available under $30, which makes it a great choice for an everyday sipper. One thing I love about EWSBV, other than it being a great whiskey – is that it changes a bit from barrel to barrel and year to year. 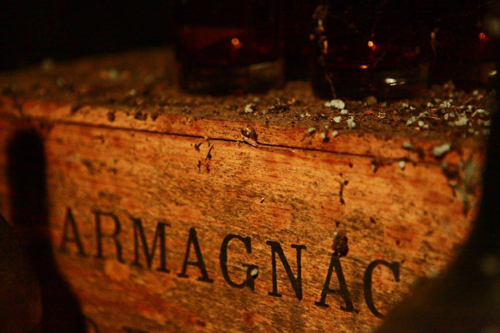 Which makes each new bottle and each new vintage a whole new adventure. As the first reoccurring annual bourbon release of the year, Evan Williams Single Barrel Vintage in a way sets the stage for the rest of the annual whiskey releases to come. And, rightfully so, as this whiskey is on its 17th year of production! 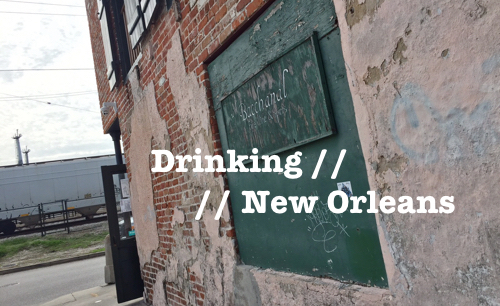 Pretty amazing considering where the Bourbon industry was at that point in time. It must’ve taken a lot of foresight and faith to start working on a single barrel vintage release project like this in the mid 90s. Thankfully, now, it’s just one of a growing multitude of these types of whiskeys. 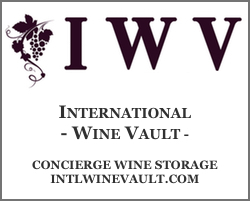 The 2003 vintage just recently hit the market and, as I’ve been doing every year since the 1999 vintage, I picked up a bottle as soon as I could. 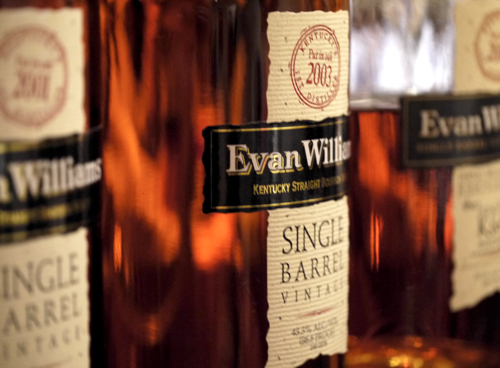 All Evan Williams Single Barrel Vintage whiskeys are aged nine years, and are hand-selected from single barrels by Heaven Hill master distillers Parker and Craig Beam. The whiskey is bottled at 43.3% and has a hand-written barrel number and bottle date. 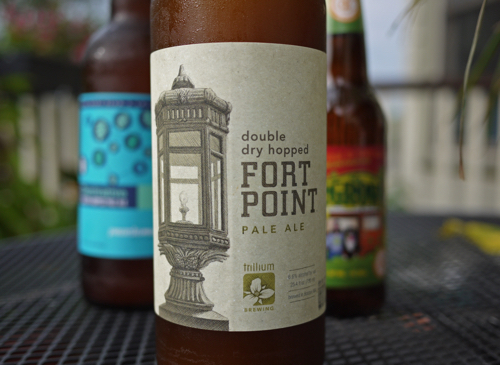 This particular bottle I’m drinking from is number 168, barreled on April 15, 2003 and bottled on February 14, 2013. The first thing you notice about the Evan Williams Single Barrel is the wonderful aroma – a mix of woody vanilla, cinnamon red hots, candied orange, maple syrup, earthy spice and a little root vegetal note. The previous few years had more of a cherry fruit note, which isn’t as present here. Last year’s release, in particular, had a very fruity candy cherry thing going on that I wasn’t too fond of, so nice to see a slight variation. On the front palate I get a creamy rich vanilla, with dry peppery cinnamon and toffee. There’s a really nice oak spice, with rich orange, mellow honey and a long warm finish. The 2003 comes off dryer and spicier than in recent years. Tasting them side by side, there are a lot of similarities to the 2000. Which is a high compliment, because I still think 2000 has been one of the very best EWSBV releases of all time. There’s also a little more earthiness here than in some of the previous years. In comparison to last year’s 2002 vintage, the 2003 is less sweet, and overall has a more complex flavor profile. 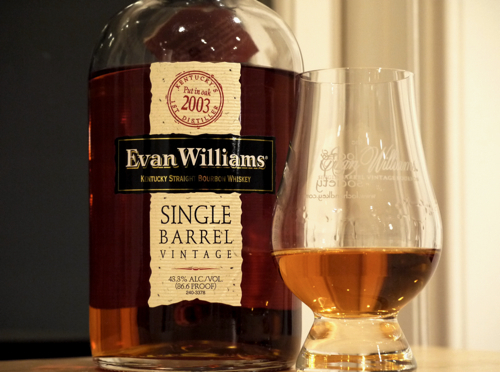 Compared to the high bar that 2000 and 2001 set, I felt that last year’s release missed the mark just a bit, so the 2003 for me is a step back onto the great path that the Evan Williams Single Barrel was on. As John Hansell put it, this whiskey is “seamless and perilously drinkable.” And, seriously, kicking back and sipping on this whiskey is completely satisfying. I’m not quite as high as the 93 point review that Whisky Advocate just gave EWSBV 2003, but I’m close. Especially when you consider that this is going to cost you $30 or less. 91 points. Highly Recommended. Big thanks to Larry at Heaven Hill for the sample. I’m glad somebody else found the cherry flavor in the 2002 Vintage a bit off-putting. I haven’t grabbed a bottle of the 2003 Vintage yet, but I am always excited for the Single Barrel Vintage releases. Thanks for the comment, Phil. Yea, I was glad to fine that the 2003 strayed away from that candy cherry. Makes a big difference.